Proponents of intermittent renewable energy such as solar PV and wind often claim that these energy sources will reach parity with standard grid power in the near future. As discussed in a previous article, however, this is a highly misleading claim, primarily because intermittent and non-dispatchable renewable energy is worth much less per kWh than steady and dispatchable baseline power. In order to illustrate the implications of this distinction, the aforementioned article valued intermittent PV similarly to unrefined coal. The central assumption underlying this way of thinking is that the costs associated with energy storage (which is required to make PV useful to society at higher penetrations) are comparable to the costs associated with thermal power plants (which are required to make coal and gas useful to society at higher penetrations). Under this assumption, solar PV turned out to still be about one order of magnitude more expensive than coal power. Naturally, this is a fairly crude assumption and accurate calculation of the real grid parity target for solar PV will be much more complex. This article will discuss the most important complexity: the fact that the costs associated with energy storage of intermittent renewables will be a strong function of the level of penetration into the local electricity grid. Under the assumption that the costs associated with storage are similar to the costs associated with thermal power generation, storage would increase costs roughly by a factor of 4 (as is the case for coal at $100/ton and coal-fired electricity at $0.06/kWh). However, this cost increase will be a substantial over-estimate at low penetrations where almost no storage is necessary and a substantial under-estimate at high penetrations where most renewable energy generated will have to be cycled through some form of storage. The graph below illustrates the price at which solar PV reaches parity with coal for five different storage cost scenarios assuming a coal price of $100/ton, a 30 year panel lifetime and a 5% discount rate on gradually released PV electricity. The most important comment to be made about this graph is that we will move downwards with increased PV penetration. I am fairly confident that, for most locations, we will reach the light blue line at the bottom long before intermittent renewables come close to supplying 100% of our electricity. The exact penetrations at which each of the lines on the graph will be crossed is much more uncertain though. I will give some rough estimates in this article, but would welcome any corrections by experts on this site. Initially, when solar contributes less than about 1% of electricity, the intermittency will be essentially negligible. As the blue line shows, current utility scale installed PV prices (~$2/Wp) are already close to parity with coal in the most ideal locations (highest PV capacity factors) under this assumption. However, this first percent of solar PV penetration is the only region where the standard grid parity mantra of renewable energy advocates is relevant. As we move up to a 10-20% penetration of intermittent renewables, we also move down to the red line in the graph. Under this scenario, solar PV (and wind) starts to rely significantly on the energy storage implicit in fossil fuels. Standard power plants then have to be operated at lower capacity factors and at lower efficiencies due to more ramping and more spinning reserve. One recent study for wind power calculated that costs of keeping backup fossil plants operating at lower capacity factors and efficiency (together with some added transmission costs) would increase the real cost of wind to triple the price of new gas and 1.5 times the price of new coal in the US. This represents a doubling of the standard costs calculated when the intermittent and non-dispatchable nature of wind energy is simply ignored. As we move beyond a 20% penetration rate, specialized energy storage becomes necessary. According to EIA estimates, the most feasible option; pumped hydro storage, will cost about twice as much as a coal plant per watt. It will, however, lose only about half the energy lost by the coal plant in the energy conversion process. It can therefore be estimated that pumped hydro storage will inflate solar PV prices roughly by the same factor as a thermal power plant inflates the price of coal. Even though the installed PV price of roughly $0.3/Wp required by this scenario seems highly unlikely ever to materialize, it should be noted that regions with abundant natural hydro capacity could potentially achieve these penetration rates of intermittent renewables at much more affordable prices. Denmark’s wind backed up by hydro from Sweden and Norway is one such example. Very few regions on earth are suited for this kind of arrangement though. Pumped hydro is only available in certain (relatively rare) topographies. Thus, for most cases, a day or two of battery storage will be most practical. Despite lots of noise from battery optimists, the 150-year old lead-acid battery is still the cheapest option we have for this purpose, but suffers from drawbacks such as short lifetimes (especially at deeper discharge rates) and relatively low efficiencies (about 20% of energy cycled through the battery is lost). Lithium-ion batteries reduce these problems, but are also more expensive. One case study found that a lead acid battery and a lithium-ion battery could store energy for about $0.34 and $0.40 per kWh over their respective lifetimes. This cost (which must be added to the cost of renewables) is much greater than fossil fuel power even by itself. To better link this to the graph above, consider that most suppliers will sell you about $4 of batteries per watt of solar PV for protection against blackouts (example) where the battery warranty period is only about half that of the panels. It should also be mentioned that, in the hypothetical scenario of very cheap solar PV and relatively expensive storage, it could be more economical to simply build a large overcapacity of intermittent renewables and spill a large portion of the power produced. In the graph above, this will reduce the capacity factor of the installation, but could create a transfer from the purple to the green line. Finally, the light blue line right at the bottom comes into play when one starts thinking about longer term energy storage to compensate for longer cloudy (or wind-still) periods or even for slow seasonal variations. This line (which really is a matter of complete impossibility for intermittent renewables) is especially applicable to regions with long cloudy spells and seasonal mismatches (e.g. solar PV in Germany). On the flipside, however, it is also much less applicable to regions with very reliable renewable energy resources that are well aligned with seasonal demand (e.g. solar PV or solar thermal in desert areas). Chemical storage is probably the only viable option for such longer-term storage requirements with hydrogen normally being the first option that comes to mind. A Spanish study found that hydrogen from combined wind and solar projects would cost about €25/kg which translates to about $0.90/kWh of hydrogen internal energy. Converting this stored energy back to electricity at a later time will inflate the price by another factor of 3 (similar to natural gas power plants), bringing the total cost up to $2.70/kWh – about 50 times more expensive than conventional power. Other forms of chemical storage might be more economical, but it will be very difficult to rise above that light blue line. The previous article stated that current solar PV technology is still about one order of magnitude more expensive than coal. Based on the above analysis, it can be stated that this will be the case at roughly 20-40% penetration of solar and wind into our electricity networks (about 8-16% of total energy), beyond which the prospects for PV (and wind) will rapidly deteriorate. This is a good example of the law of receding horizons discussed earlier. 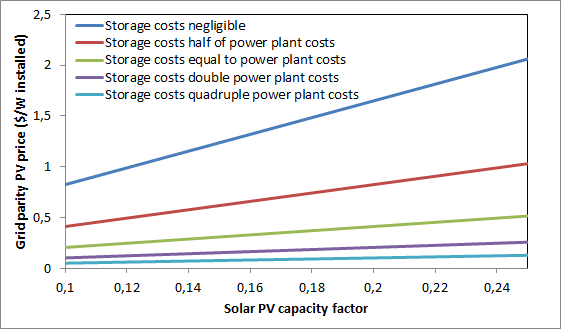 However, the cost of storage is not the only influential variable in determining the real grid parity target for solar PV. The next article will therefore investigate four additional factors: the coal price, the PV panel lifetime, the PV discount rate and a CO2 price. I was hoping that machine automation will “kick in” by the time the renewables reach max grid integration and make the lithium class batteries for much cheaper. But a normal li-ion has only about 500 cycles, whereas a LiFePO4 has about 2,000. And if we could “overbuild”, then there would be tens of thousands of partial charge/discharge cycles… but then again, they need balancing, to insure long life. Perhaps, automation will make the lead acid much cheaper by that time when solar reaches 20%.. But we have to make sure that the government doesn’t deny the free market the right to MINE all the stuff needed to make large scale solar a reality. Thanks for writing about these issues. The calculation used to get the $0.40/kWh throughput cost that was linked in the above article assumed 1900 cycles of a battery which costs $600 per kWh of capacity. Optimistic estimates project long-term price declines to about $200 per kWh of capacity, but, as outlined in an article I have just completed, even this would still be far too expensive to compete with the energy storage implicit in fossil fuels. To me, molten salt batteries appear to be a better bet, mostly because of their long lifetimes. However, this technology is yet to prove itself in the real world. Yes, let’s hope and pray for limited government… My worry is just that, as more and more problems arise from our multifaceted sustainability crisis, government will try to implement more and more narrow-minded fixes which just make the situation worse.